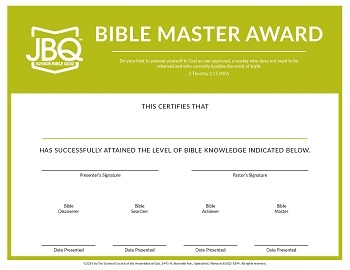 The Bible Master Award Program is an excellent way to recognize your kids’ hard work in mastering the Bible Fact-Pak questions and answers. Package includes ten certificates with 3 sets of 10 seals for the Discoverer, Searcher, and Achiever mastery levels, and an instruction sheet. - Part of the Junior Bible Quiz ( JBQ ) program.